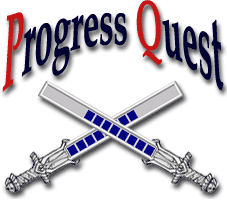 Progress Quest is an antic and fantastical computer role-playing game, well worth the time you'll spend playing it. And it won't cost you a farthing! By all means, download the client or play it right in your browser. Jayden Steffe has been a PQ fan since the earliest days, and the slow cooker of his warm heart has now produced a Progress Quest theme song. Keep it looping in the background as you play (also in the background). Progress Quest has been integrated into the excellent Windows93. It's a perfect fit, you'll have to agree.